This pub, which is situated on the corner of William Street West and the Small Crane, was originally known as the West End Bar. In the 1930s it was owned by Paddy and Angela (known as Alda ) Smith who lived over the pub. They also owned the garage behind the pub, which Paddy managed. This was where Bell, Book and Candle bookshop is today. Mrs Smith was from Loughrea and when she and her husband retired, they sold the business to her brother Mickey Coen. He ran it until 1970 when Padraig Cummins took it over. Padraig had a business in Menlo making concrete slabs. 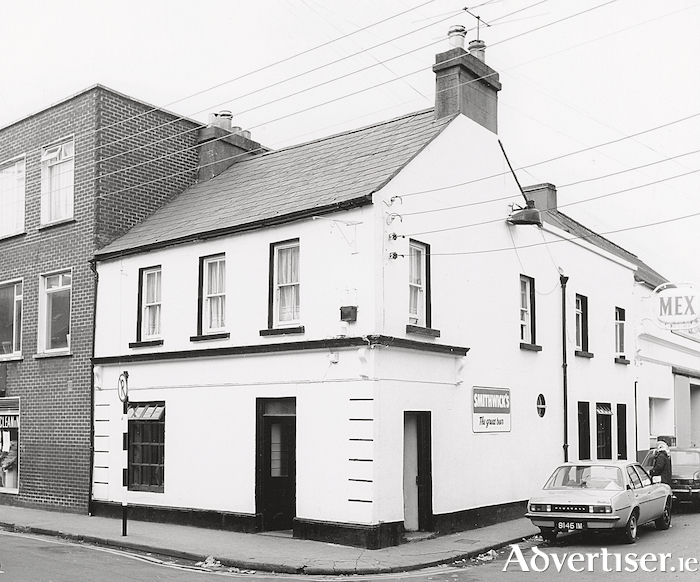 In 1978 Paddy Connors took over the lease and he changed the name to The Crane Bar after the Small Crane where it is situated. He opened the bar upstairs and started nightly music sessions, and the pub has become famous for the quality of traditional music that has been played there ever since. In 1986 two businessmen from County Mayo, Gerry and Simon Roche, took it over. They were farmers and investors who only held on to the pub for a year before passing it on to Martin Lally, and he too was only there for a year before he moved to Taaffe’s Bar in Shop Street. In 1988, Josie Conneely, a former Fianna Fáil county councillor and property developer from Ballyconeely, took over the Crane and ran it for six years. Then it was the turn of Dave and Mary Larkin who were in charge until 2001. Dave Larkin still runs the very popular singers’ club in the pub every two months. Mick Crehan and John O’Halloran took it over in 2001, and since 2006 it has been run by Mick Crehan and Maeve Joyce. There were three cranes in market places in old Galway, all used to weigh potatoes and vegetables. One was in Eyre Square, one in Woodquay, and one, which was usually referred to as ‘The West Crane’, was in William Street West. The area is always marked on old maps as the Potato Market. It seems in the last century, this name evolved into the Small Crane. This regular market usually attracted farmers from the Rahoon and Barna/Furbo areas to come and sell their produce. If business was quiet, they would amuse themselves by competing to see who was the strongest, who could lift heavy sacks of potatoes the highest, etc. Obviously all of this activity was good for business in the pub. The Crane Bar is a must-visit venue for traditional Irish music aficionados and many of the legends of that genre have played there. For a number of years now, Mick Crehan has been the organiser-in-chief of the Galway Sessions Festival which has expanded to a number of other nearby pubs. On Sunday next, June 17, at 2pm, the Crane will also become part of the Galway Poetry Trail when a beautiful poem by Tom French will be unveiled on an outside wall of the pub close to Miko Russell. The poem is simply titled ‘The Crane Bar’ and is sponsored by Galway City Council. Rita Ann Higgins will do the unveiling and all are welcome.